Ndumiso Lindi hails from Zwelitsha, a small township next to King William’s Town in South Africa’s Eastern Cape. He came to Cape Town to study a national diploma in graphic design at Cape Technikon. And this is where the “stand-up” bug really bit. After regular performances on the local comedy circuit, he won the amateur category in the Red Bull Comedy All Stars Comedy Challenge. He has toured South Africa performing at the Barnyard Theatre Festival in Durban, Pretoria and Johannesburg and has shared the stage with local comedy stalwarts like Kurt Schoonraad, Mel Miller, Riaad Moosa, Dave Levinsohn, Cokey Falkow and David Kau. This rock-solid stand up act has come a long way in a short time, recently being chosen for the prestigious 46664 series of comedy shows, touring the arenas of South Africa, as well as several African countries, including Nigeria and Ghana. 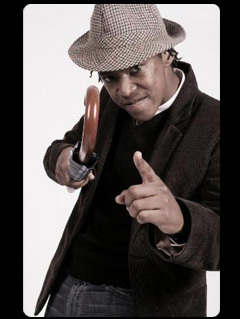 Known for his trademark hat and funky urban stylish look, Ndumiso has headlined all the important stand-up gigs around: Blacks Only, Heavyweights Comedy Jam, Nando’s Comedy Festival as well as hosting both the Vodacom Comedy Campus Tour and Vodacom Funny Festival and debuted his first One Man Show, “Here I Stand” at On Broadway Theatre in CPT in August 2011. He is also a firm favourite amongst corporate clients and they frequently book him for their various events. Ndumiso’s material is an honest and hilarious observation of everyday life in South Africa, the diversity of South African cultures and how unique black people can be, especially the newer, younger generation. He paints the nation from a young black man’s point of view. His ability to adapt his unique style to diverse audiences is proof that this relatively young performer is blessed with talent and instinct, and his rapid rise is well deserved. "When I watch this guy, I forget that he's younger than most of the established comics... He's got such ownership of his stage, and he's a pleasure to watch and to work with... Keep your eye on this guy, if you can." John Vlismas.